Welcome to the LinaBag Giveaway! Here is another great giveaway! I know I would love to own this fashionable diaper bag! Good Luck! Lina Jake is a new company that has taken blending fashion and function and turned it into an art form. Not only do you get a high end look, but you can also rest assured knowing that your things are well protected with a waterproof exterior. The LinaBag is a great diaper bag for moms who are looking for MORE in a bag! Not only does it have tons of pockets for holding all sorts of things, but it also comes with those small details like an extra shoulder strap for when you want more control of your bag. You can check out a full review from More Than Mommy. Not only is this a great bag, but Lina Jake is giving one away to a lucky reader! If you are a resident of the U.S. 18+, simply enter on the Rafflecopter below. *More Than Mommy received a complementary bag in exchange for her honest opinion. rays of bliss is not responsible for sponsors who do not fulfill prize obligations. I love the organization they have. I cannot stand a big purse with no pockets, just throwing everything in there. I learned the side pockets snap closed! I learned that these can be used as a diaper bag or just a fashionable bag. These bags are lightweight and darling. I love the non-diaper bag look and the leather handles! Organization is key for us, the lay out of the bagsis great! i would love to own this bag in purple, i love the detachable strap. I love all the separated pockets inside and snaps on the outside. OOH! 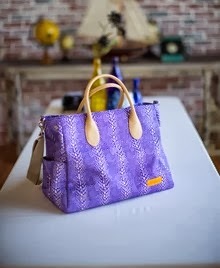 A purple bag, w/ pockets & everything! We’ve been using a tote bag. Love the amount you could put in it,plus, no diaper bag look! Sign up today and receive 20% OFF! I love how many pockets there are inside the bag. I learned that it’s lightweight. I like the zippered compartment that keeps my keys and wallet separate from other items. I learned that their bags are all made of vegan leather – but it’s still waterproof, making it durable and easy to clean. I learned there is plenty of room for cloth. I learned that is made of vegan leather! And that it has various pockets for bottles, keys, phone, etc. I learned that the bag is waterproof and has lots of pocket for organization! Love the bag in Purple!my current diaper bag is very heavy! Being this is light weight I could really see myself carrying it! I love that this bag allows you to hold it in different ways. There are some days were using a messenger style bag is a must! I like how much stuff the bag holds. I love it Green and like and has leather handles to make it look like a purse and not an ugly diaper bag! I love the fact that it has so many compartments. Learned that there is plenty of room for this bag to be a diaper bag and its waterproof. Cool!! I like the colors of the bag, that there’s so many compartments, and that THE STRAP COMES OFF!! I like the green color and I learned they have purple, green, and orange. Such a craft and fashionable company! I love that it is waterproof and that the strap is removable!! water proof and lightweight! sounds perfect!